If you are looking for my Sparkle Creations card, please scroll down or click HERE.. Thank You! Hi there! Have you seen the new Taylored Expressions July Key Ingredients? The team has been showing some fabulous projects on The Key Ingredients Blog this week! Today is Day 3 of July projects, and it is my day to show what I've come up with.. In case you haven't heard, Taylor is having a Key Ingredient DT Call... extra, extra... read all about it... HERE! Oh my, Stephanie, this is a fabulous gift! Thanks for sharing your project and the recipe. . .yumm! This looks so adorable! Great sneak peek! OH, fabulous sneak peek!!! Even the peeks look incredible!! Looks enticing! Off to see it all! These are fabulous Steph! 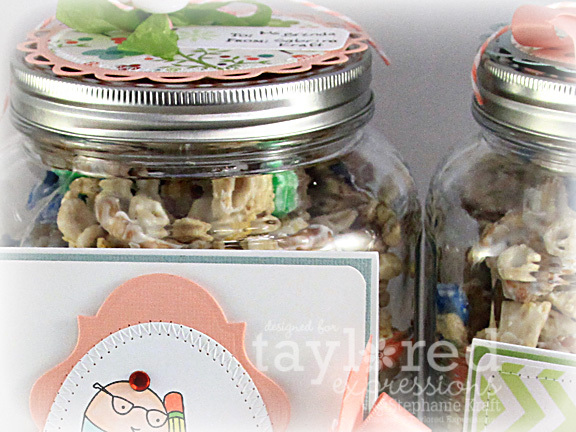 The crunch mix in the pretty jars and cards are so sweet! I'd love to receive something like this!